"When I got there, about 20 minutes early, the line of sign wavers stretched the full length of the library grounds, along the edge of the road, 6 or 7 people deep! I could hardly find a place to park. I nabbed one of the last spots in the library lot, and as I got out of the car and started walking, people seemed to join in from every direction, carrying signs. 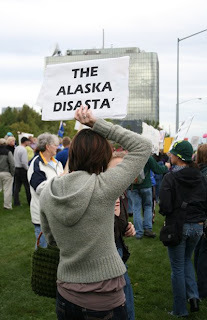 "Never, have I seen anything like it in my 17 and a half years living in Anchorage. The organizers had someone walk the rally with a counter, and they clicked off well over 1400 people (not including the 90 counter-demonstrators). This was the biggest political rally ever, in the history of the state. I was absolutely stunned. The second most amazing thing is how many people honked and gave the thumbs up as they drove by. And even those that didn't honk looked wide-eyed and awe-struck at the huge crowd that was growing by the minute. This just doesn't happen here." 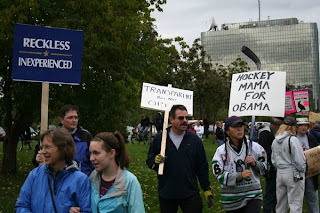 Befitting its literary location in front of the public library, some of the homemade signs rhymed—reading "Hockey Mama for Obama" and "The Alaska Disasta," for example—and others like the raven image shown above were indubitably poetic (or Poe-etic) in origin. 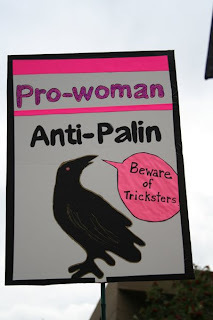 It seems that while Palin and the Palin/McCain campaign may be closed-lipped on the subject of her relationship to this blog's favorite genre, it's clear that her well-versed opposition is not.